Watch for the EZ-Sweetz infomercial due to air on The Food Network, the Cooking Channel, and some other channels tomorrow or Wednesday, Sept 18 or 19. (Update: they are now scheduled to start of Friday.) Low-carb celebrity chef, George Stella, stars in the ad (doing his best imitation of the guy in the ShamWow commercials!). EZ-Sweetz is offering a fantastic deal to introduce this new sweetener, which will soon be available in retail stores nation-wide. The booklet pictured above that I put together for them will be included as a bonus as part of a special package purchase. 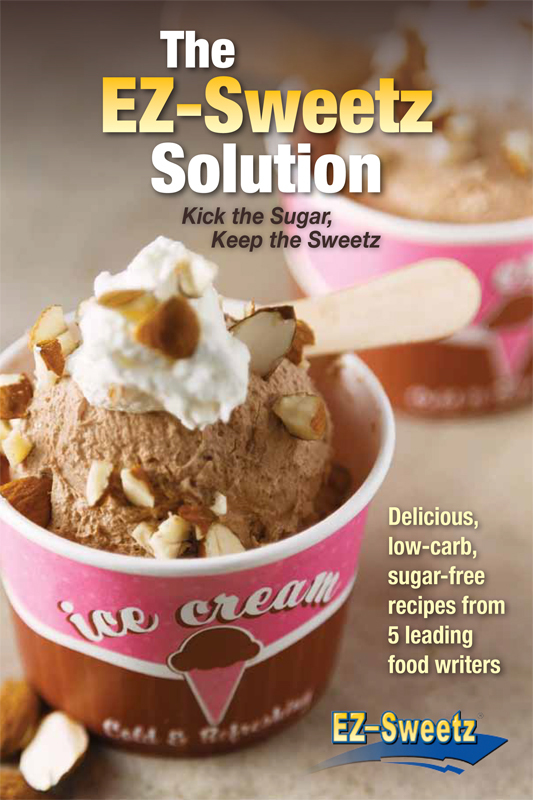 It features recipes from Yours Truely and four of your favorite low-carb cooking experts: George Stella, Laura Dolson, Dana Carpender, and Jennifer Eloff. It is only available as part of this promotion! They are also offering a copy of Nourished as an option in the specially-priced bundle. Here is the actual order page that will be featured in the commercial so you can be among the first to take advantage of this sweet deal: http://www.buysweetnow.com. Cookbook, Dana Carpender, EZ-Sweetz, George Stella, Jennifer Eloff, Judy Barnes Baker, Laura Dolson. Bookmark. Looks great! I'll make sure I tune in!